A Mafia Sentinel in GTA III. The Mafia Sentinel is a gang version of the Sentinel used by the Leone Family in Grand Theft Auto III and Grand Theft Auto: Liberty City Stories. In GTA Liberty City Stories, the vehicle is named the Leone Sentinel. The Mafia Sentinel is evidently a four-door sedan based on the games' renditions of the Sentinel, resembling a real-life mid-1990s BMW E36 3 Series, but this car was closely resembling a 1990-1995 BMW M5, which is a high performance version of the 5 Series; the Mafia Sentinel is also related to the sporty Sentinel XS variants in later games. It is essentially a tuned version of the Sentinel, with a bodykit, tinted windows, and blinds over the rear window. Its paintjob is always dark gray in GTA III and black in GTA Liberty City Stories, and cannot be resprayed into any other color in a Pay 'n' Spray. In the strategy guide for GTA Liberty City Stories, pictures of a white Leone Sentinel can be seen. Like any gang car, attempts to steal one with a Leone Family member inside will result in surrounding peers attacking the player. A Mafia Sentinel in GTA III (Rear quarter view). A Leone Sentinel in GTA Liberty City Stories (Rear quarter view). The Mafia Sentinel's handling is slightly sharpened, whilst average speed is noticeably quicker over its stock counterpart. Its performance coupled with its four occupant capacity makes this an ideal car for bank jobs, attacks on rival gangs, and street racing. A wreck of a Mafia Sentinel in GTA III's introduction. 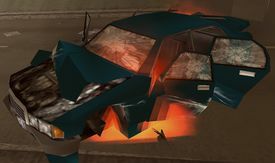 A burning wreck of a Mafia Sentinel (as indicated by its spoiler and grilled rear windsheild) is seen during GTA III's introductory mission at the devastated Callahan Bridge. The car is painted turquoise instead of a Mafia Sentinel's regular dark grey color. 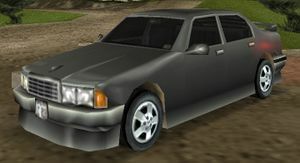 The Mafia Sentinel was meant to appear in Grand Theft Auto: Vice City, but cut during development. This is evidenced by the handling files, and it is probably replaced by the Sentinel XS, probably a leftover from GTA III. In the strategy guide for GTA Liberty City Stories, pictures of a white Leone Sentinel can be seen. The same pictures can also be seen in the GTA III strategy guide. This page was last modified on 22 February 2015, at 20:36.